Background: The present epidemiological study was planned and conducted to determine the prevalence of bronchial asthma in school going children of Agra, and to assess the precipitating factors in the causation of bronchial asthma mainly on the basis of the questionnaire and spirometry wherever possible. Methods: A total of 2175 school children in the age group 6-12 years from the two schools located in Agra were surveyed. These schools were selected on the basis of the surrounding environment and the socioeconomic status of their students. A detailed history was taken from students using a validated questionnaire. A total 153 cases of bronchial asthma were identified on the basis of the questionnaire. Out of which only 79 cases were subjected to spirometry. Spirometry could not be done in 74 students as their parents did not give consent. Results: The prevalence of bronchial asthma was found to be 7%. There were 61.4% male and 38.6% female patients having the disease. The study revealed that the upper classes had the largest number of students suffering from bronchial asthma. There is a higher prevalence of bronchial asthma in nonvegetarian children. Conclusion: This survey shows that the prevalence rates of bronchial asthma in school population (6-12 years) of Agra are almost similar to those seen in other parts of Northern India. Background: With higher exposure to animal during the life, the risk of sensitization to animals may get more. The purpose of this study was the comparison of sensitization to animal allergens in children with asthma from those with adult-onset asthma. Materials and Methods: This cross-sectional study included 100 children and 100 adults with asthma as well as 100 healthy individuals with no history of asthma and atopy. Skin tests were performed in patients and controls to allergens using a panel of 15 animal allergens. Results: The rate of sensitization to animal allergens was 33% in children with asthma and 39% in patients with adult-onset asthmatics compared to 10% in the control group. Children with asthma were most commonly sensitized to dog (10%), hamster (8%), and cat (7%). Among patients with adult-onset asthma, the most common sensitizations were to dog (19%), canary (14%), and cat and goat (each 7%). 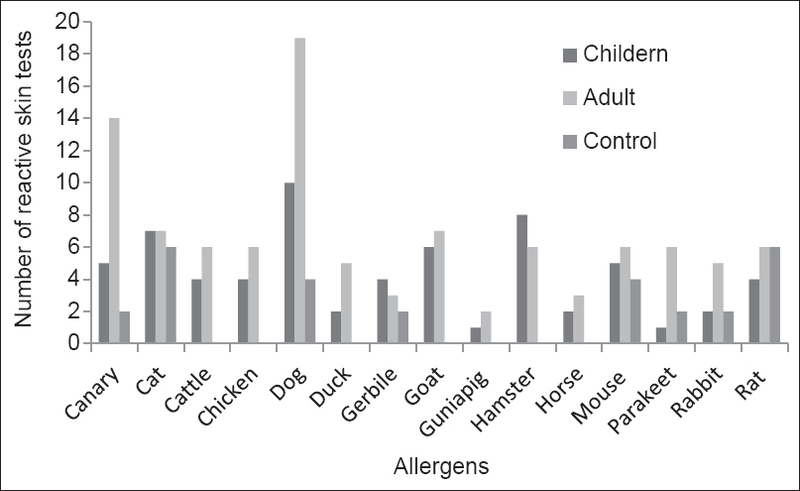 The frequency of sensitization to animal allergens was not significantly different between children and adult-onset patients with asthma. Conclusions: We observed that sensitization to dog and canary was higher in adult-onset than children with asthma. Efforts to improve conditions at the public buildings to reduce the load of airborne allergens are also potentially helpful. Aim: To determine the association between anemia and asthma among children as case-control and also investigate the effect of hemoglobin (Hb) on asthma and atopy markers. Settings: The case-control study was performed during a period between March 2012 and October 2013, on asthmatics and controls (<14 years) at Pediatric Allergy-Immunology Clinics and Primary Health Care Clinics, Qatar. Subjects and Methods: A total of 520 cases and 520 controls matched by age, gender, and ethnicity. Sociodemographic and clinical data were collected through physician diagnosis and questionnaire. Their health status was assessed by past or present clinical manifestations, family history, physical examination, body mass index (BMI), anemia, Hb level, calcium, and phosphorus. Results: About 56.3% of asthmatic and 51.9% of controls were males and 43.7% of asthmatic and 48.1% of controls were females. The mean age (± standard deviation, in years) for asthmatic versus controls was 9.3 ± 3.28 versus 10.2 ± 3.38. Anemia was more prevalent in asthmatics than controls. Lower Hb levels were associated with more allergic disease and elevated serum IgE. The study revealed that Hb level, iron and ferritin deficiencies were considerably higher in asthmatic children compared to healthy children. There was a significant difference found in the mean values of Hb levels between asthmatic (10.58 ± 3.05 g/dL) and control children (11.75 ± 3.10) (P = 0.006). Besides, mean IgE was statistically significantly higher in asthmatic compared to control children (P < 0.001). There was a significant correlation between Hb level and total IgE in asthmatic compared to controls (r = 0.295 vs. r = 0.268, P = 0.001). The analysis revealed that the predictors for development of asthma in children were serum iron deficiency (P < 0.001), phosphorus (P < 0.001), parental consanguinity (P = 0.046), breastfeeding < 6 months (P < 0.001), BMI (P = 0.005), less physical activity (P < 0.001), family history of asthma (P = 0.028), and ferritin (P < 0.001). White blood cell count (P < 0.001), serum IgE level (P < 0.001), and serum calcium level (P < 0.001) were considered as the main risk factors after adjusting for age, gender, and other variables. Conclusion: The study findings showed a high prevalence of iron deficiency among children with asthma and allergic diseases. Serum Hb levels were lower in asthma, allergic rhinitis, and atopic dermatitis children. Hb level and anemia were strong contributors for asthma and allergic diseases. Background: Aeroallergens as one of the most common cause of allergic disease derived from pollens, dust mites, fungi, and animals. The prevalence of aeroallergens is different in various areas. Objectives: This study was designed to identify the frequency of sensitization to aeroallergens in patients with allergy in Shiraz, Southwestern Iran. Materials and Methods: This descriptive study included 656 patients with allergy from Southwestern Iran from July to December 2014. Sensitization to aeroallergens was assessed by skin prick test using a panel of common 15 aeroallergens in studied patients. Results: A positive skin test to at least one of the applied allergens was seen in 74.5% of our patients. The female to male ratio and mean age of the patients were 1.27 and 27.6 ± 14.7 years, respectively. 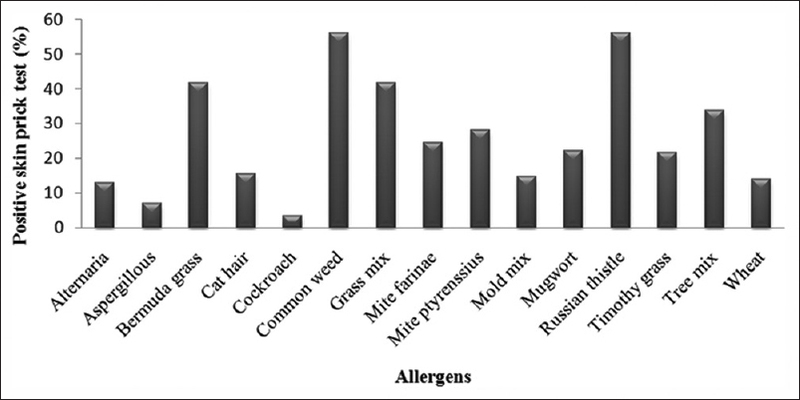 Pollens were the most common type of aeroallergens (64.6%), followed by dust mites (34.6%), cockroach (30.6%), and molds and cat hair (16% for each). Among pollens, the frequency of sensitization to weeds, grasses, and trees was in turn. Conclusion: The results of the present study revealed that pollens play as a main sensitizing allergen in asthma, allergic rhinitis, and eczema. This pattern was compatible with the results from studies carried out in this area. 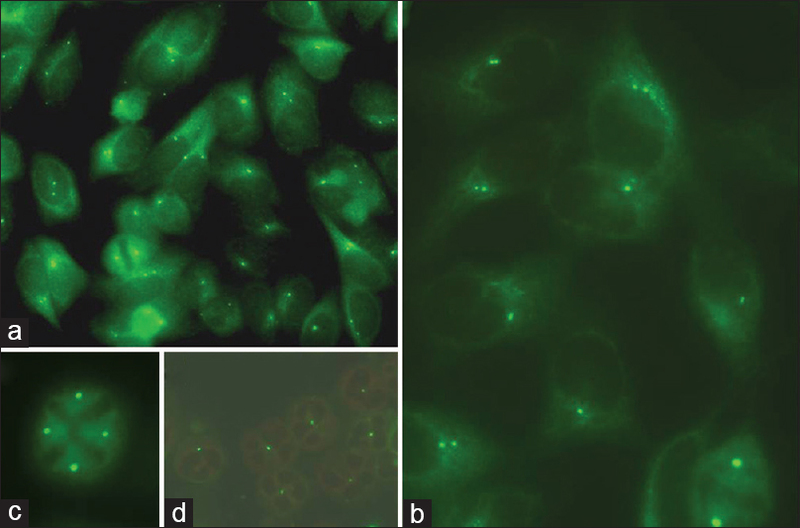 Anti-centriolar pattern of staining by indirect immunofluorescence (IIF) on human epithelial type 2 (Hep2) cells is rarely observed, mostly in association with scleroderma and scleroderma-like connective tissue disorders. This paper describes four patients with anti-centriole antibody positivity along with a review of the available literature. In this retrospective study, a total of four cases whose serum showed the centriolar pattern on Hep2 cell lines during IIF examination were reviewed. The presence of anti-centriole antibody in the serum should herald the diagnosis of scleroderma spectrum; Raynaud's phenomenon and pulmonary arterial hypertension should be specifically looked for. In the absence of features of autoimmunity, patients should be screened for Mycoplasma infection. A 45-year-old Indian gentleman presented to our allergy clinic with symptoms of hives and intense pruritus for the past 8 months. He complained of considerable burning type of itching, which was only partially controlled with antihistamines. 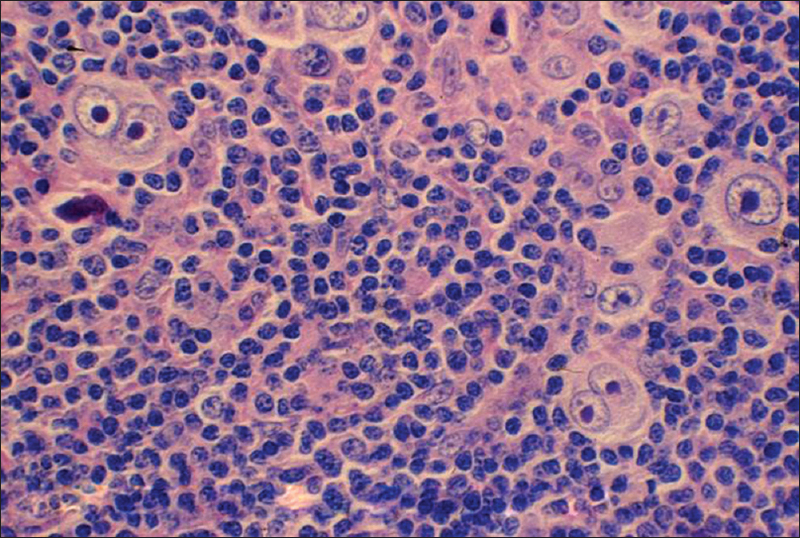 He was thoroughly investigated, and his hives were found to be a skin manifestation of Hodgkin's lymphoma. He subsequently underwent chemotherapy and is now in clinical remission. Hereditary angioedema (HAE), also known as Quincke's disease, is an autosomal dominant condition characterized by painless and nonpitting swelling of soft tissues. It is not an allergic phenomenon, as it appears to be on initial examination, thus fails to respond to injectable steroids and adrenaline. The disease may become potentially life threatening due to involvement of airway, thus early suspicion, recognition, and treatment of disease are important. 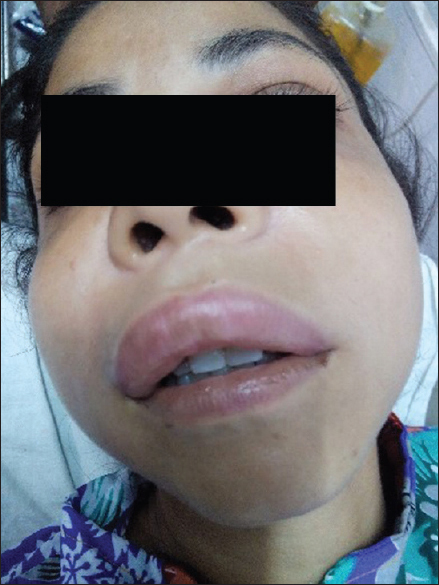 We present here a case of 22-year-old female who developed sudden facial swelling and breathlessness. In the presence of poor response to anti-allergic treatment, past and family history of similar complaints, and low C1 esterase levels, a diagnosis of HAE was made. The most common food protein causing allergy in infants and young children is cow's milk, but persistence of this allergy into adulthood is rare. It is estimated that 2-3% of the general population suffers from cow's milk allergy (CMA), but reports of anaphylaxis in adulthood are limited. This case report discusses persistence of CMA with several anaphylaxis episodes in a 12-year-old girl who had allergic reactions from 6 months of age. She is also unable to tolerate milk from all available animal sources including goat and sheep. Skin prick test was strongly positive at 10 mm at 7 years of age, with specific IgE cow's milk >100 kUA/L when she presented with anaphylaxis episodes 5 years later. Patient-specific management plans need to be in place to avoid and manage anaphylaxis, especially for patients who do not have easy access to healthcare.